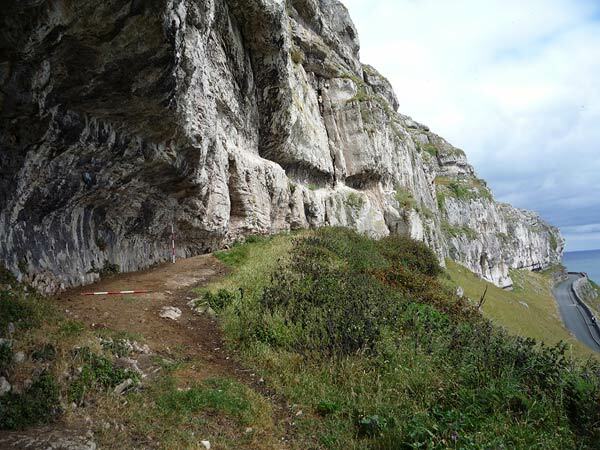 In 2011 a new prehistoric rock shelter site on the Great Orme was identified on the Great Orme. This was a potentially important site and one at risk because worked flint and a small shell midden were exposed and eroding. A small evaluation excavation was agreed and carried out in partnership with the National Museum, Cardiff in May 2011. A one metre wide trench was excavated across the depth of rock shelter which produced deposits consisting largely of limestone scree, mixed with occupation material including pottery, animal bone, marine shells, charcoal and worked flint. It seems likely that there was an upper horizon of Neolithic or Bronze Age occupation and a lower horizon of Later Mesolithic occupation. A preliminary report was produced (GAT Rep. no. 1002) including assessments of the pottery, lithics, bone, shells and carbonised remains. Two radiocarbon dates have so far been received, from the lower horizon, one in the mid 4th millennium cal BC and one in the early 8th millennium cal BC. The former is assumed to be intrusive from the upper horizon.